National Audience - Travelers, especially those from out-of-town, look to online resources to plan their trips. Think about it; they have no access to YOUR local newspaper or phonebook. Whether they are visiting from the suburbs or from another city, TFF is always available. Trusted Resource - TFF is recommended by official tourist websites, such as Seattle.gov and SanDiego.org, worldly known guidebooks, such as Frommer's and Insider's Guide, and trustworthy media sources, such as USAToday and Wall Street Journal. #1 Website in Taxis - TFF is visited by over a million potential taxi riders every month. Search engines rank us #1 for many taxi related keywords. 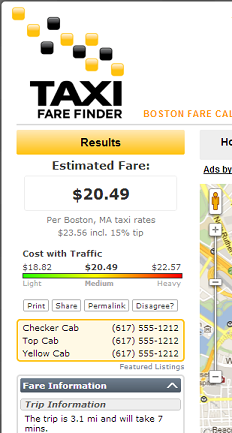 Try typing, "taxi fare " in Google and see what happens. Acquire *New* Customers - Many travelers come to TFF because they are new to taxis in your area. Expand your loyal customer base by being the first to reach them. "Our business increased by at least 50% almost immediately, and has remained steady ever since. In addition, our customers put a greater faith in our integrity, since we can not only show them what the price SHOULD be before the ride, but also show them how to figure it for themselves." "Of all the places on the internet to list your company, TaxiFareFinder is one of the, if not THE, best. Not only does it direct more customers to your business but it also gives the customers peace of mind that your prices are fair and correct." The primary mission of TaxiFareFinder is to make the public knowledgeable and comfortable with utilizing taxi services. We would like to make taxi information as accessible to people as possible; therefore, if you would like to have your taxi company information listed on our site, please send us your information, such as your dispatch phone number and website URLs, through our Contact Us page. We cannot promise all requests will be honored; however, we will try our best. Be the first company to be seen by TFF users. 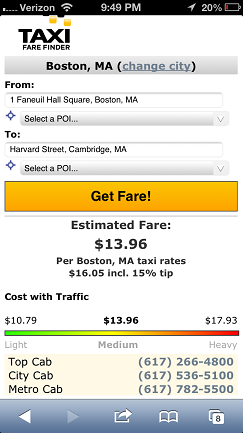 With preferred listings, your taxi company's dispatch # will be listed on TFF website, mobile site, and partner sites. On smartphones, users will simply click and call your dispatch number. TaxiFareFinder is a website about taxicabs; however, there are always advantages and needs for hiring limo services. Therefore, we are accepting Preferred Listings for non-taxi services. Limo listings will appear below taxi preferred listings (if they exist) and will be marked with an "L" logo. There is currently an example on Boston Calculator. If you are interested, please contact us using the form below. Terms and Conditions for being listed on TaxiFareFinder.com can be found here. If you are interested in advertising with us, you will need to fill out an application. You will be asked for your company information as well what type of listing you prefer. Our marketing manager will respond to each submission. If you have any questions or would like to check the status of your application, please contact us.